This basic powder puff (wool type) ball is a simple design that has lot’s of potential and is suitable for knitting tweens and beginners. This double pointed needle pouch tutorial by Kathryn Ivy (Designed by Grace Schnebly) is sure to give your knitting hands a rest while you sew up this jiffy little pouch for your knitting basket. This ugly yet cute stuffie is a quick pattern, it looks like a great little cat toy to tease the little purries with. Add some catnip to get them really interested. Thicket.com.au has this wonderful “Angel In Our Midst” pattern available. Visit the gallery for the details on how to get this pattern via e-mail. Does the little boy (or big boy) in your life need his own blankie? If you are a charity knitter than this One ball chemo hat is perfect for you. It makes up fast and looks great, which means it is the perfect pattern for mass production. 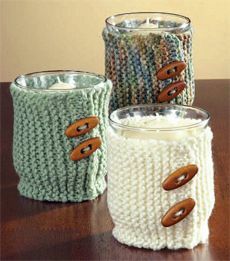 I have seen cozy’s for just about everything from coffee cup cozy’s to mobile phone cozy’s and even a cozy for your toaster but I haven’t seen a cozy for your candle holder. I have a few of these Dust Bunny’s around my house at the moment and thought how cute this little knitting project was.